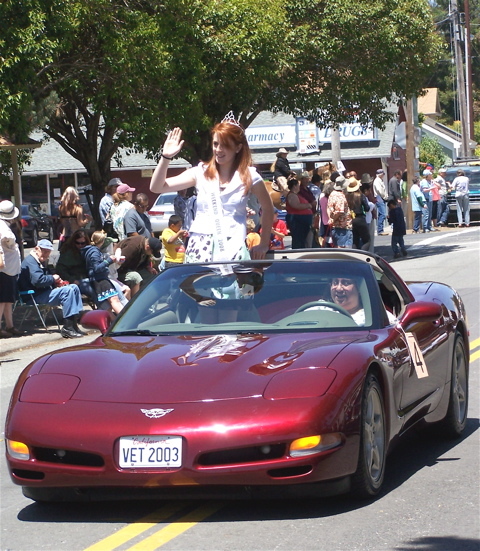 Western Weekend Queen Lianne Nunes greets the parade crowd Sunday. Her driver is Debbie Rocca. 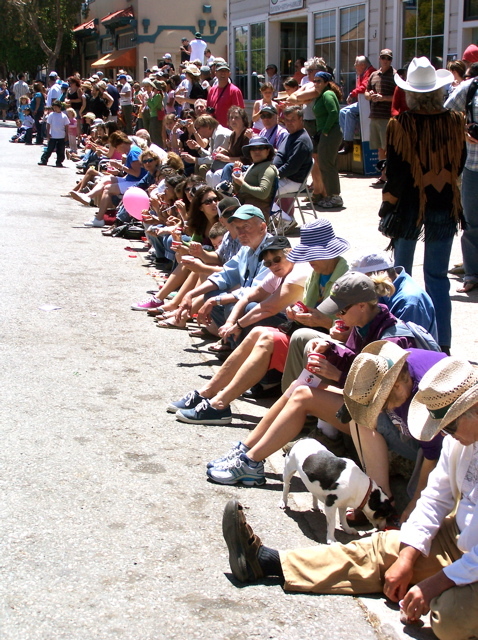 Sunday’s parade in Point Reyes Station drew almost 1,000 spectators, who enjoyed sunny skies and a little less wind than we’d been having all week. 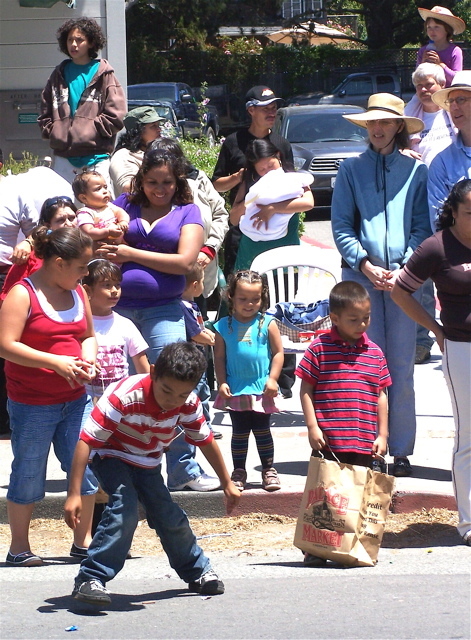 In many ways, Western Weekend is a small-town celebration of its ranching heritage. Of course, not all small towns are the same. 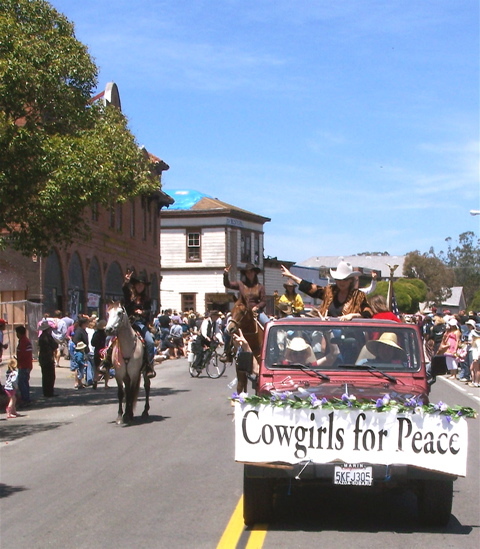 Cowgirls for Peace in recent years have become a fixture of this small-town parade. Another politically progressive group of women, Main Street Moms, in the past have demonstrated against President Bush’s war policies. This year the Moms demonstrated for clean energy. 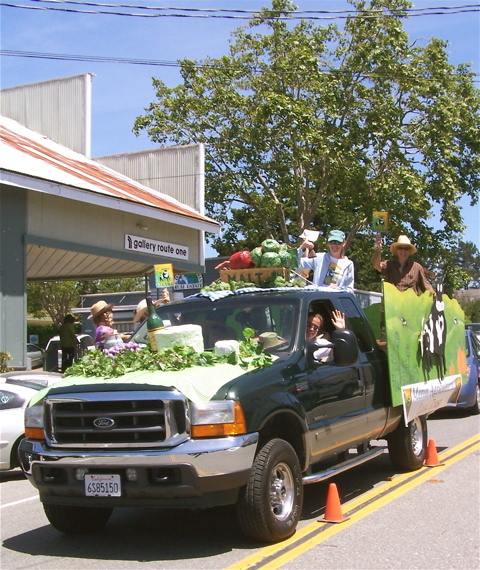 The Marin Agricultural Land Trust float. MALT, a nonprofit, was founded in 1980 as an alliance between ranchers and environmentalists to protect family farms and preserve open space. It works like this. Ranchers voluntarily sell commercial- and residential-development rights to MALT — typically in exchange for half the market value of their property. Under this arrangement, the ranchers give MALT an agricultural-conservation easement across their land while retaining ownership of their ranches. So far, MALT has acquired easements on more than 60 ranches for a total of more that 40,000 acres. The Nave Patrola spoofs the World War II Italian army — at times chanting “Il Duce,” the title taken by Fascist leader Benito Mussolini. 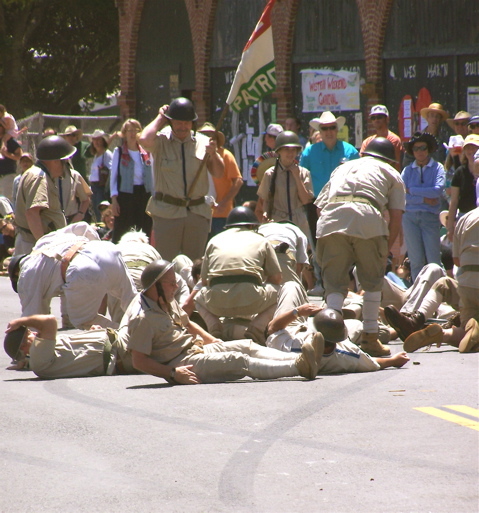 Patrol members manage to continually get their marching orders confused, collide with each other, and fall down. Back in the early 1970s, a representative of the Italian Consulate in San Francisco after seeing all this complained to parade organizers (to no avail) that the spoof denigrated Italy. 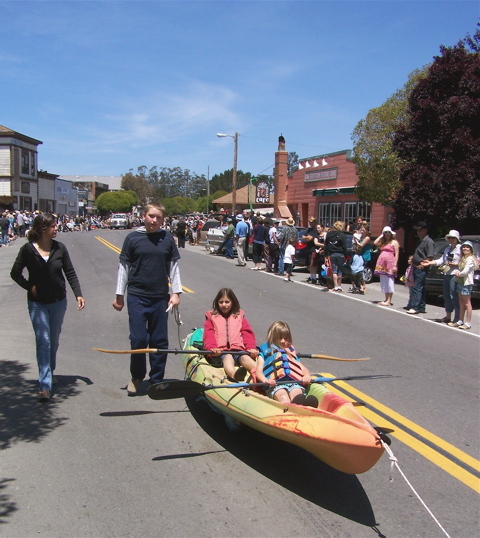 Tomales Bay State Park’s parade entry was a kayak on wheels pulled behind a truck. 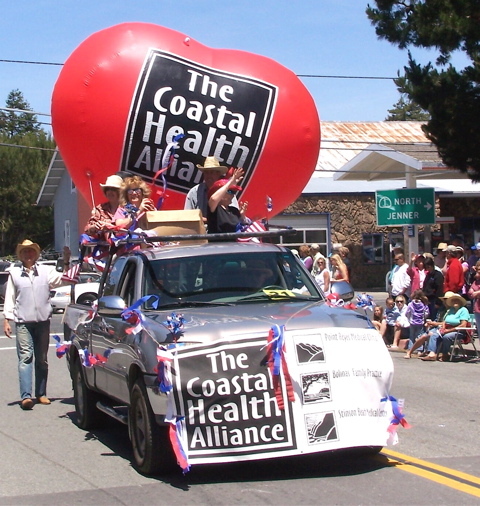 The nonprofit Coastal Health Alliance operates clinics in Point Reyes Station, Bolinas, and Stinson Beach. 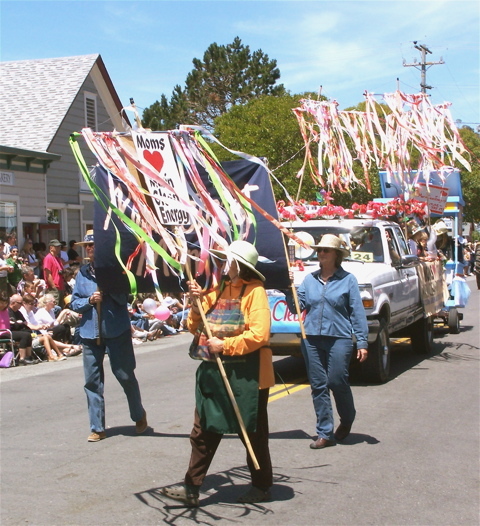 For youngsters, grabbing wrapped candies, which riders on parade floats throw, is often as important as seeing the parade. 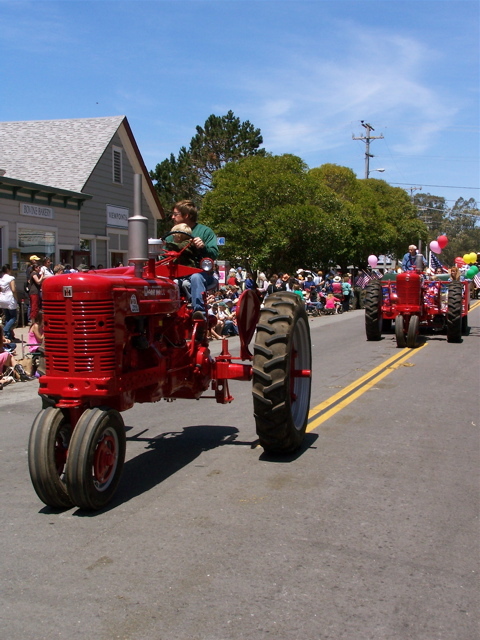 Marin Sun Farms entered an especially ambitious float in the parade. 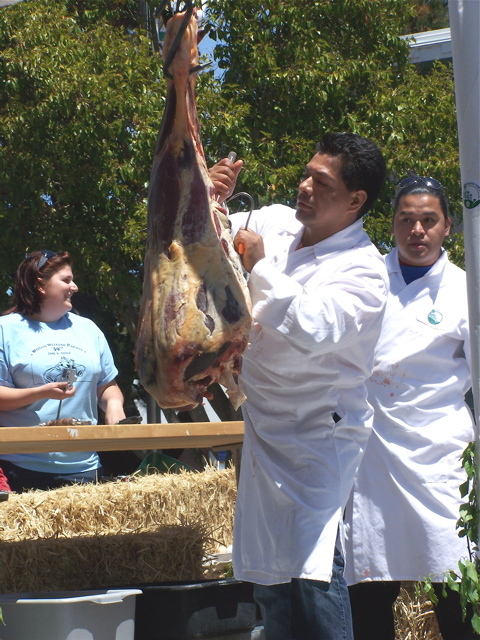 The grass-fed, organic beef ranch on Point Reyes has a butcher shop in Point Reyes Station, and a butcher on Sunday cut up a quarter of beef while standing on the bed of a truck rolling in the procession. 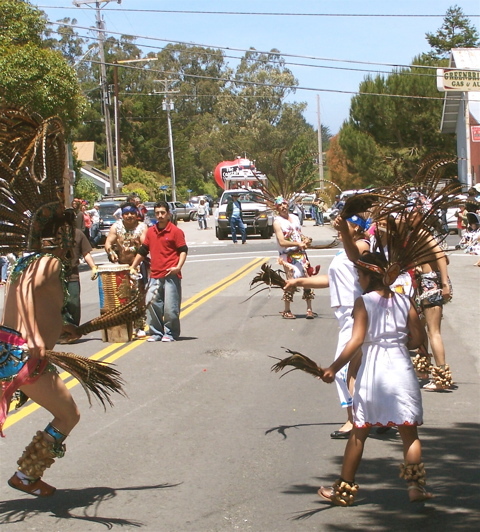 The Aztec Dancers keep in rhythm with the beat of drummers (left rear). 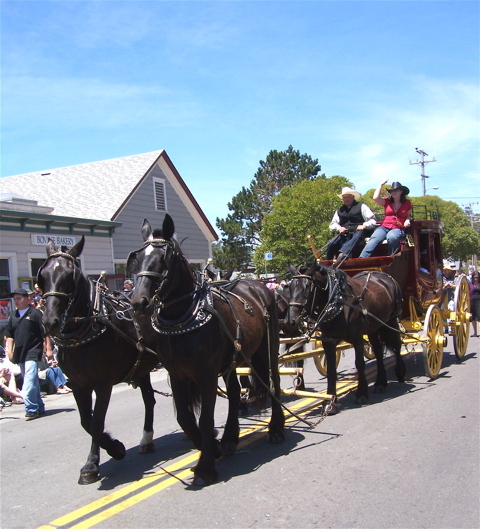 Wells Fargo’s having bought the Bank of Petaluma in Point Reyes Station three months ago, the Wells Fargo Stagecoach showed up for this year’s parade. 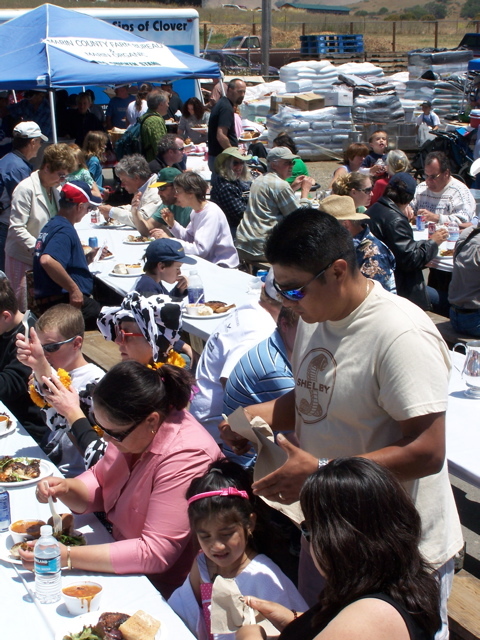 Marin County Farm Bureau held a chicken barbecue next to Toby’s Feed Barn after the parade. Toby’s was also the site of the parade’s judging stand, a Cow Flop Drop fundraiser for Halleck Creek Riding Club, a chili cookoff, and various other Western Weekend festivities. Great pics, Dave. Can’t believe the shot of the guy slicing off cuts of beef while in a moving truck. I can barely do that whilst stationary. 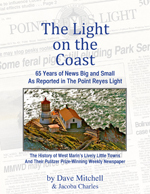 Sparsely Sage and Timely is powered by	WordPress 4.9.10 and delivered to you in 0.365 seconds using 52 queries.